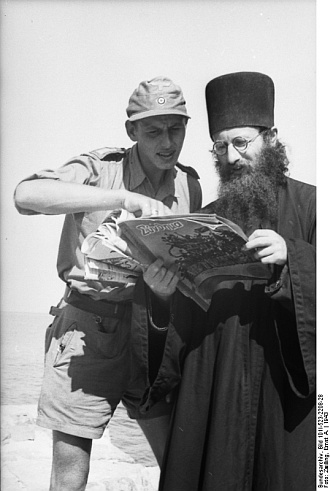 August 1, 1943: an orthodox resident of the ancient monastic state of Mount Athos is being handed a copy of the Greek edition. 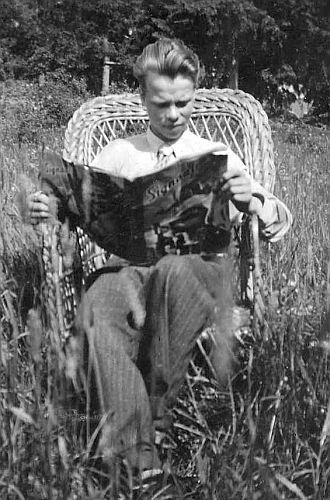 Click on image for a higher-resolution scan. PK-Aufnahme: Sdf. Zwilling, Lw.KBA Südost. Date: August 1, 1943. 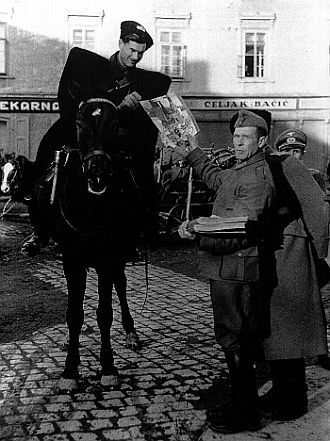 Accompanying original text: "In der Mönchsrepublik Athos. Das 'Signal' in griechischer Ausgabe erweckt große Freude." 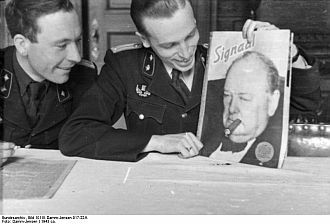 (BArch, Bildbegleitzettel zu Bild 101 I (Propagandakompanien), Bd. 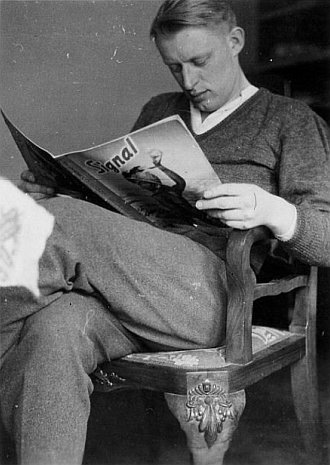 448-532, Filme 2101-2727, April 1943-August 1944). 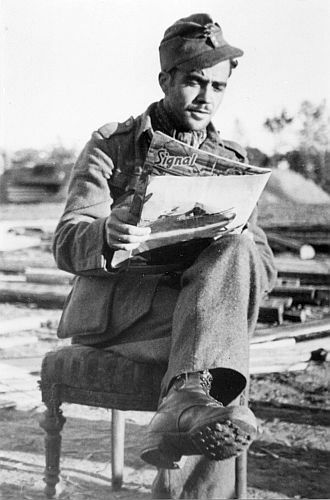 Signal correspondent Benno Wundshammer reading a copy of issue number 20/1941 somewhere in the North African theater of war. Source: bpk - Bildagentur für Kunst, Kultur und Geschichte. 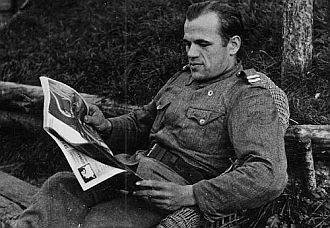 A Finnish corporal relaxing somewhere in Karelia. Photos courtesy of Raimo Kotiranta. 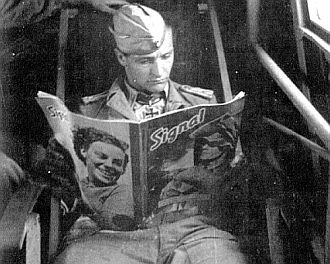 June 19, 1942: Hans-Joachim Marseille reading a copy of D/I 7/1942 on a flight across the Mediterranean. 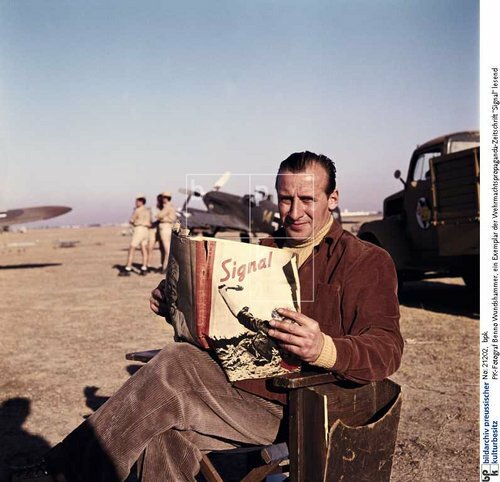 Marseille was the most successful German fighter pilot in the North African theater of war. 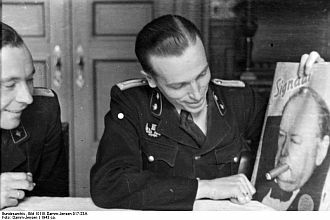 He was killed on 30 September 1942. A Spanish volunteer of 250. Infanterie-Division, or Blue Division (División Azul), which fought on the Eastern Front. In the autumn of 1943 it was withdrawn by General Franco in response to mounting Allied pressure. Volunteers which disobeyed the order to return were grouped into the Blue Legion (Legión Española de Voluntarios), but this unit, too, was repatriated back to Spain in November 1944. Spaniards who still chose to fight on the side of Nazi Germany were absorbed into various German units. Photo courtesy of Carlos Diez. Give that man a cigar! Two Belgian-Flemish members of the Vlaamsche Wacht having fun with the Churchill cover of the Dutch issue number 8/1943. Click on images for higher-resolution scans. 1. 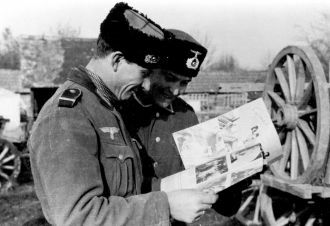 Two members of a Cossack volunteer formation with copies of the Russian edition (issue number 9/1943). 2. Copies of Rus 9/1943 are being handed out to members of a Cossack cavalry unit. PK photographs, probably Croatia, late 1943. Click on images for high-resolution scans. Return to top of page | Disclaimer © 2002 – 2010, Alexander Zöller.